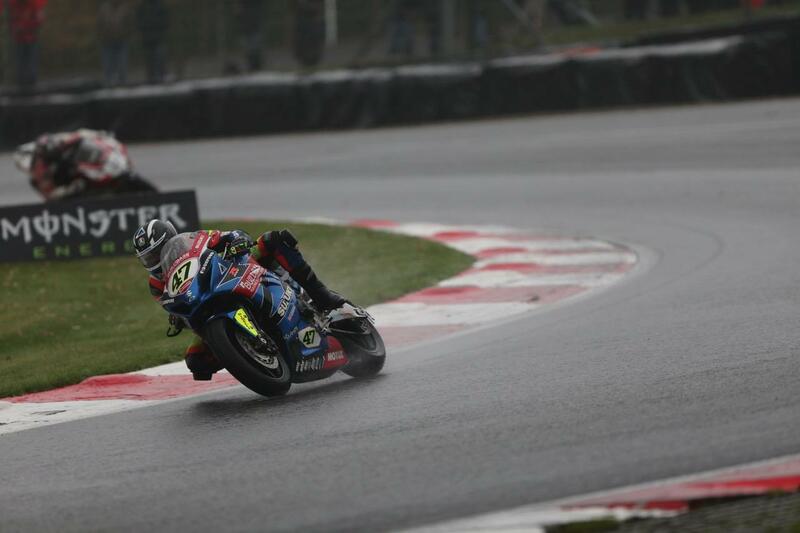 Richard Cooper took a dominant victory in a sodden final Bennetts British Superbike race at Brands Hatch, crossing the line an impressive 7.4 seconds ahead of second placed Tommy Bridewell. It was champion Leon Haslam who bolted off the line to lead at turn one, but Cooper had the lead by Druids and didn’t look back. As would be expected in such treacherous conditions, the attrition rate was high with eight riders failing to finish the race, including third-place championship man Glenn Irwin. Sporting a special championship livery, Haslam occupied third for most of the race before series rival Jake Dixon duffed him up on the exit of Druids. Unsettling Haslam’s rythmn, he had a number of moments before settling for sixth place, completing his incredible 100% finishing record this year. Christian Iddon took fourth for Tyco BMW ahead of Josh Brookes, while Gino Rea was seventh for OMG Suzuki. Early frontrunner Jason O’Halloran dropped back to eighth ahead of Smiths BMW duo of Peter Hickman and Sylvain Barrier. The final result saw Haslam’s series lead a whopping 70 points over Dixon, the largest championship-winning margin in Showdown history. Glenn Irwin secured third in the championship for Be Wiser Ducati ahead of Josh Brookes and Peter Hickman with Bradley Ray dropping to sixth. Tommy Bridewell’s positive end to the year with the MotoRapido Ducati squad, including two podiums at Brands Hatch, saw him claim the 2018 BSB Riders’ Cup.